All the delicious flavors of a cheeseburger rolled into one frugal, easy recipe. 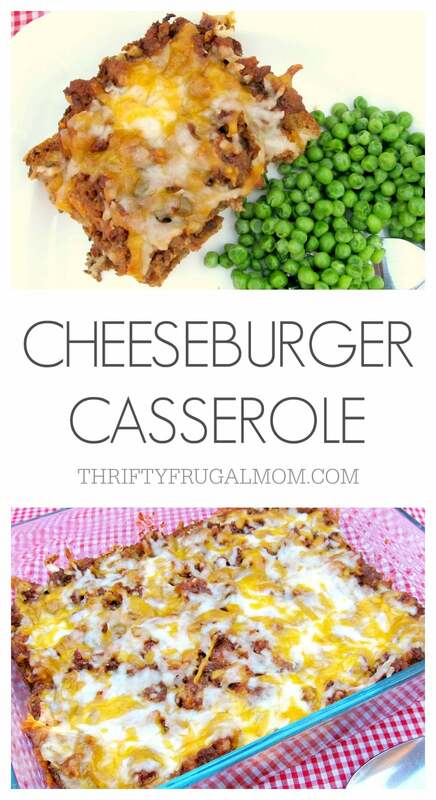 This Cheeseburger Casserole is a definite family friendly meal! Our kids really aren’t picky eaters, but they definitely like some dishes much better than others. And this Cheeseburger Casserole? It’s one of their favorites! Every time I make it, they scarf it down and offer plenty of comments about how much they love it. And as a mom, that is always welcome! As the cook of the house, the fact that this dish is super easy to make and frugal ta-boot makes it a winner with me! Not to mention the fact that it really is rather delicious. I mean, who can resist all the yummy flavors of a cheeseburger in one easy-to-make dish? Not me! Fry ground beef, onion and celery until ground beef is cooked. Add ketchup, prepared mustard and salt. Repeat toast and beef layers. Mix milk, egg, dry mustard and pepper and pour over everything. Sprinkle remaining cheese on top and let sit for 5 minutes to melt cheese. * I’ve used an 8×8 baking dish before, but you kind of need to really squish the bread in to fit. If you end up using an 8x8 dish, you could just tear the bread into pieces instead. That should work too! We love casseroles. Thanks for sharing! Would this work as a freezer meal? Missy, I know a lot of people don’t think much of casseroles, but we love them too! I would think that this would freeze well, although I haven’t tried it. The milk would be the biggest issue, but I don’t think it would really affect it. I keep wanting to try it, but so far havne’t gotten it done. Maria, you are BRILLIANT! :) Seriously, I have no idea why that wouldn't work, especially if you let the casserole thaw completely or almost completely. And if you like casserole, then I think you'll for sure love this one! This casserole looks delicious !!! I'm always on the look out for easy meals that can be thrown together in a hurry. This sounds like a keeper. A must try this week. Thanks so much for sharing !! Yes, easy fast meals are my go-to as well! I enjoy more complicated recipes too, but this season of my life, they just don't work very well. oooh, I've been trying to figure out a way to do 'make ahead' hamburgers. It's hard to be frying things up and have them hot and ready with a baby around. I FAR prefer anything I can make earlier and keep warm in the oven until I'm ready. But does the milk make the bread soggy??? Also, I agree with freezing all but the milk mixture--I do that with some casseroles, adding the dairy just before I bake. I'm with you about preferring things that you can make ahead of time. Because you toast the bread, the milk mixture doesn't really make it soggy. It's the consistency of a breakfast casseroles that have egg/milk in them- not exactly like toasted bread, but not totally mush either if that makes sense. Hope you all enjoy it as much as we do! I have never done it, but I would imagine it could be- and it's a great idea! It would probably work better if you just tore the bread up into bite sized pieces though, just because it would fit in the crock-pot better. I'm not good at guessing how long things should be cooked in a crock pot either, so I'm not sure I'm much help on that part. 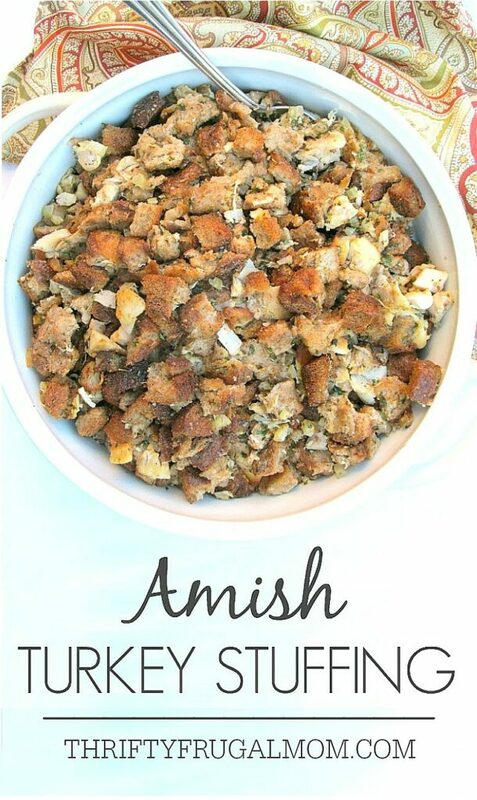 Maybe you could look at some crock pot breakfast casserole recipes and kind of go from that? If you try it, I'd love to know how it worked out for you! Classic recipe, thanks for sharing! I like the bread crumbs. To be truly frugal these days I'd substitute hamburger for turkey. Hamburger prices are ridiculous! Yes, ground turkey is definitely a great money saving substitute! Hamburger prices are making me cringe too. My Mother, who may have been one of the original "frugal moms" (having been raised during the depression!) used to make this for us when we were kids. So glad to have found this recipe again! Thank you for sharing! You have to love frugal moms! :) And some of those Great Depression era ladies were absolutely amazing in how they were able to stretch stuff. I love reading articles from that era. Happy that I could help you reconnect with an old favorite.